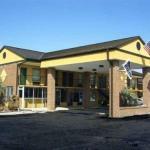 Located near Highway 521 this hotel is a short drive from Sumter Mall and Westmark Plaza Shopping Center. It features an outdoor swimming pool and offers accommodation with free Wi-Fi. Every accommodation at Travelers Inn and Suites Sumter features a cable TV; many include a microwave and refrigerator. A telephone and coffee maker are provided and wake up service is available. A fresh continental breakfast is prepared each morning at the Sumter Travelers Inn and Suites. An on-site meeting room is provided and guest laundry services are available. This hotel is a 7-minute drive from Sumter Opera House and an 8-minute drive from Swan Lake-Iris Gardens. Shaw Air Force Base is just 8.5 miles away.